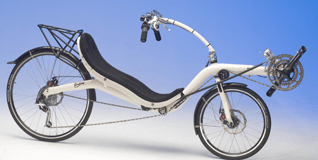 Lowracer recumbents originate from Holland. It's all about reducing wind resistance. With the shoulders laid back and the cranks high, you present very little surface. Low profile to side winds also helps keep you on track when a gust comes. They look fast standing still, and feel fast when you're rolling down your favorite road. 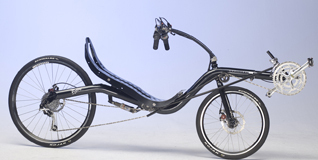 The Challenge recumbents have optimum front end geometry in any category they offer bikes in. 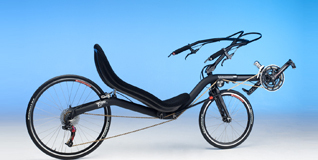 The Fujin series has become known as the finest handling low racer available. AVERAGE WEIGHT 35 cm / 13,8 "
AVERAGE WEIGHT 33 cm / 13,0 "